Joseph was born in 1994, shortly before the genocide that claimed the lives of nearly one million Rwandans. Immediately following the genocide, Joseph’s parents fled with their newborn into Congo, joining thousands of Rwandan refugees. Joseph grew up in a refugee camp until both his parents and all his siblings died, leaving him alone. An aunt brought Joseph back to Rwanda but sadly, being elderly and ill, she also passed away, leaving the fourteen-year-old alone to fend for himself. Unable to support himself and without any known family, Joseph turned to the Rev. Gatera for help. Offering his own money and counselling to help Joseph heal from his traumatic experiences, Rev. Gatera began seeking donations to fund Joseph’s education. 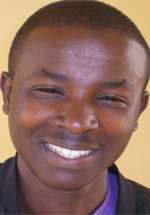 Joseph became one of the first orphans supported by YEGO’s vision. With YEGO’s help, Joseph was able to complete his secondary education and acquired a job as a disciplinary principal at a secondary school in the suburbs of Kigali. When Joseph first approached Rev. Gatera, he was without hope. But today, he has received personal healing, become self-sufficient, and is providing leadership and help to other youth. Joseph is a prime example of the tremendous potential that lies untapped within Rwanda’s traumatized orphans and vulnerable youth. Given the community, love, and support they need, they can rise above their pasts to become torchbearers to their generation, leading other youth into successful and healthy lives. To help other children like Joseph, please consider helping YEGO Rwanda today.